Notepad plus plus is one of famous web development platform used by millions of web developers around the world. It allows ultimate control over JS, XML, CSS, TXT, CSV, ASP, ASPX, HTML, XHTML, HTM, LOG, JSON, INI, INF, REG, PHP, CFG, JAVA, JAD, URL, VB and hundreds of more. Basically, Notepad++ is open source text and source code editor which was designed as professional alternative for windows default notepad. Editing in multiple files with using tabs inside single windows will definitely save programmers and developers time. Run this small program from USB or CD and save your project files in email to get instant access from anywhere at anytime. Notepad++ portable version is also attached below that is desire of many web and programming developers. 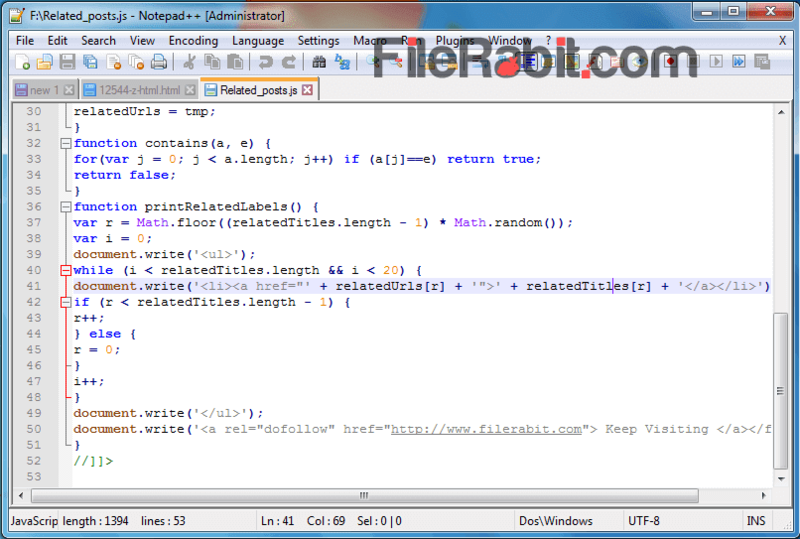 Notepad++ is handy text editor that displays row / column number, file type, coding, overall length and more. The colors of different coding text e.g. blue, red, gray, black etc. will attract developers and also save their time without getting confused between lines. Additional plugin support to use its advanced features e.g. multiple clipboard etc.